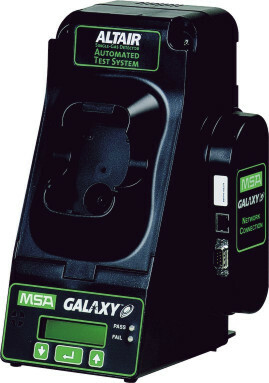 Designed to test, calibrate and charge portable gas detectors, GALAXY is MSA's fully automated test station for a broad range of compact handheld instruments. This intelligent system performs all three functions without any user intervention. Simply placing an instrument in the test station triggers its automatic operation - without the touch of a single button. The GALAXY system provides high performance from a standalone unit to a multi-unit combination of up to 10 interconnected stations and can, of course, be used with a PC. GALAXY stations are available in a range of different kits, from basic standalone units to systems with a variety of extra features, like a SD memory flash card for storing up to 1,000 individual test records or an Ethernet network interface.